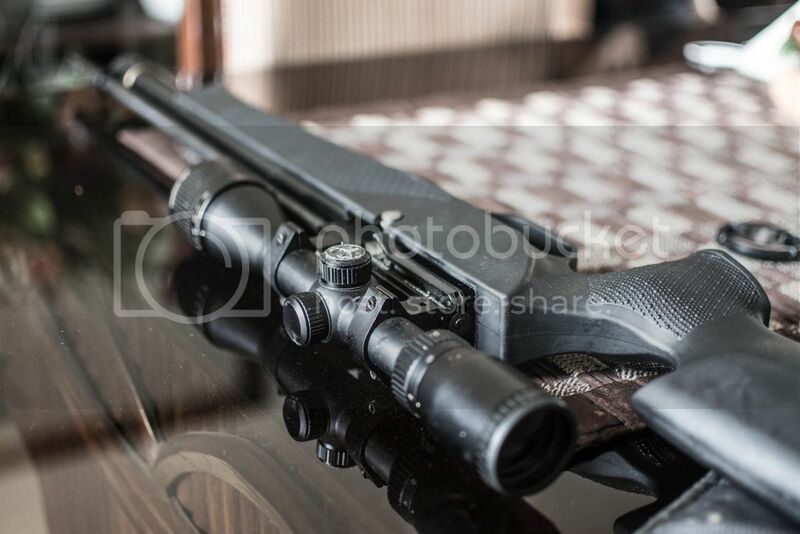 It has been a few months since Precihole launched their much awaited PX100 PCP rifles. In a country that still follows archaic Raj era laws and enforces the highly oppressive Arms Act, the launch of the first Indian made PCP should be a monumentally proud moment for us Indians. So it does come as a surprise to me when despite a few months of it's launch, no one seems to know anything about the gun. Having owned this gun for a few days here are my 2 cents. seals off the chamber is made of steel( i think). There area a few minor design hiccups though, nothing too major. For starters, the plastic ring surrounding the pressure gauge comes off with a little force and does not seat perfectly. Everything feels well seated and perfect except for two crucial( in my opinion) points. 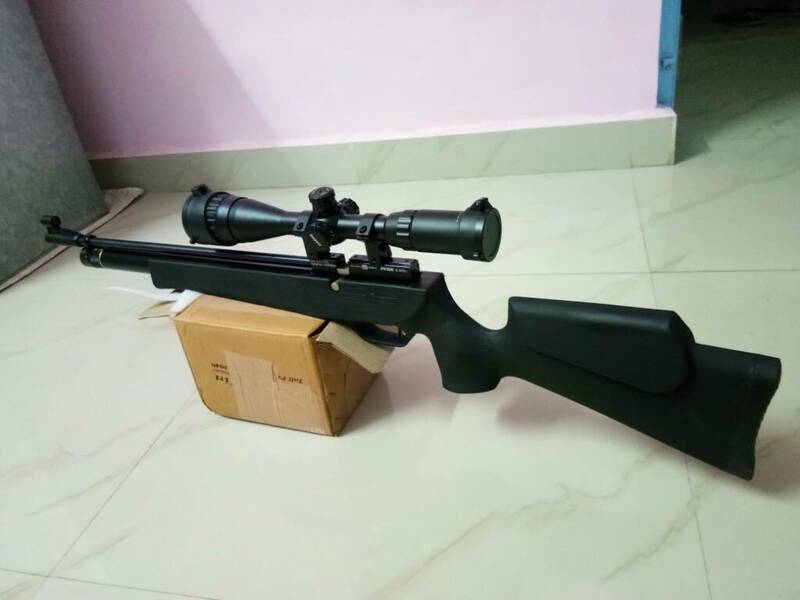 Firstly, the rifle is quite light as compared to the SX100 Orion. While this may be to the liking of some people here, personally i do not like it. 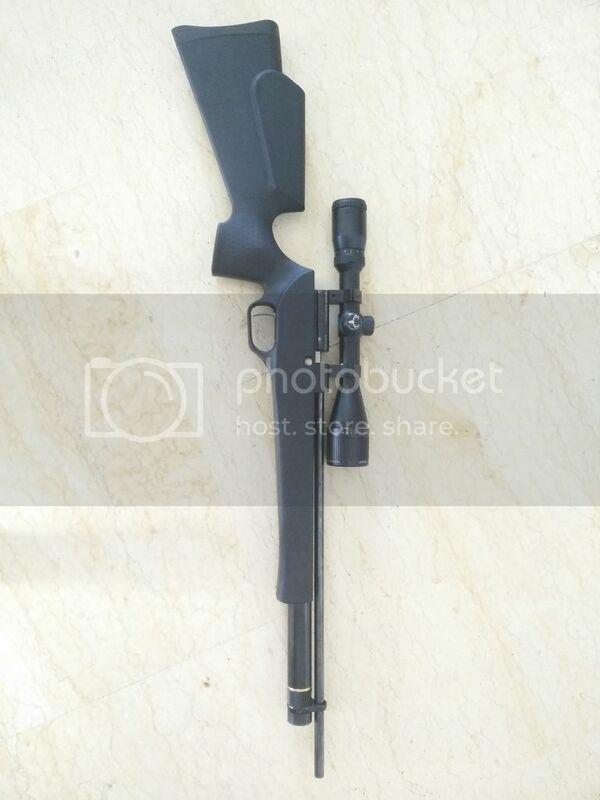 i would have preferred if Precihole had added weights in the stock or used an all steel receiver. The low weight is simply not to my liking. For the record i'm 6'0" and a quintal in weight. 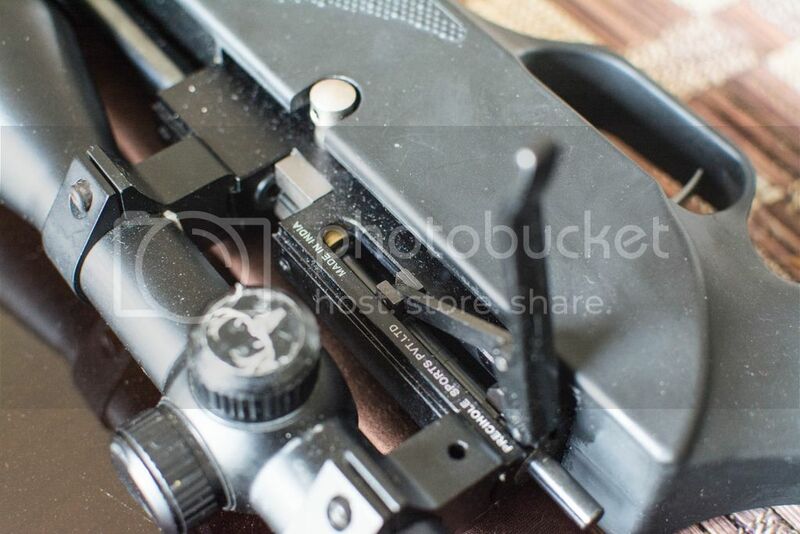 2) We could mount the front dovetail adapter for the SX/NX/VX series rifles on this to be used for 50m FT shooting. 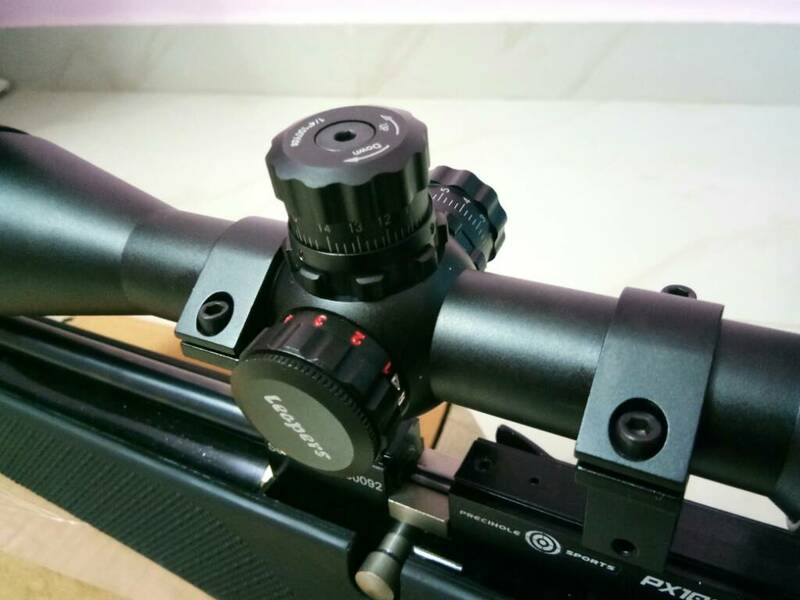 Loading pellets with a mounted scope is not a problem, i use a two piece mount of medium height and i have HUGE hands, yet loading pellets is fairly easy. Those with a 1 piece mount though might face a little problem. Also, this one thing i wanted to point out. 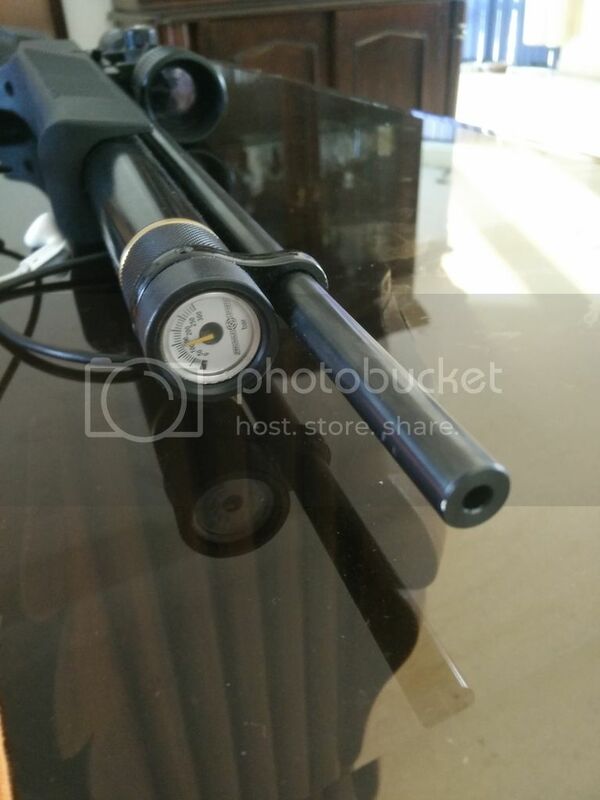 The rifle comes with an air pressure regulator which is not a very common thing in budget and mid range air rifles. What a regulator does it that it converts the high pressure of the tank into a steady preset pressure in it's own chamber. 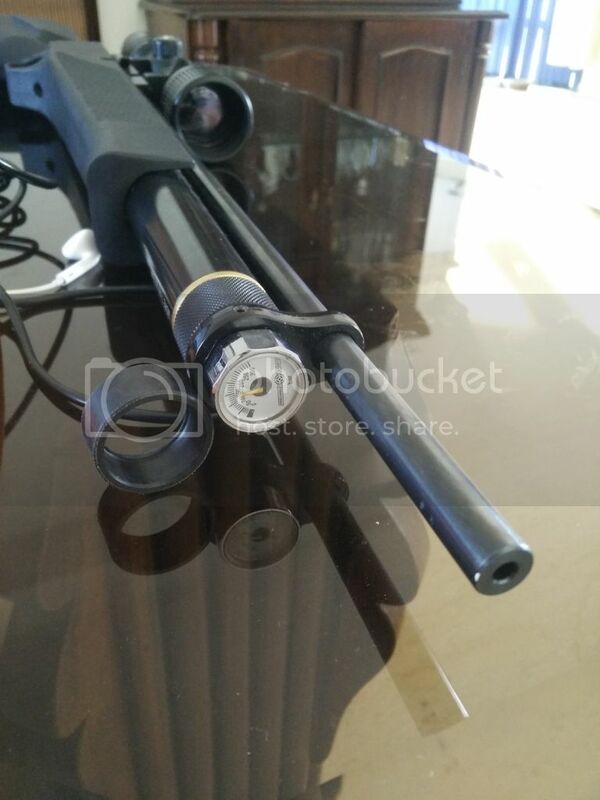 This exposes each pellet to the same pressure of air with every shot as opposed to a continuously dropping pressure for every shot in unregulated guns. Now this is a great feature with the advantages and disadvantages listed below. 2) The rifle is less likely to "pressure lock"
1) Regulators, even the very best ones have a limited life. The higher the difference in tank pressure vs regulator pressure the shorter the life of the regulator is deemed. 2) One of the simplest methods to modify the power of an unregulated PCP is to tighten the hammer spring or replace it with a more powerful one. The power gain is much less if a regulator is present as the regulator is also a restricting factor in the air flow. Now, i'm not the best shot in the world hence take these results with a pinch of salt. Also i have no experince in using chrono connect so i cannot certify its accuracy though all distances and pellet weight inputted are correct AFAIK. I daresay in the hands of a true marksman with a benchrest , the groups would be half of what they are. 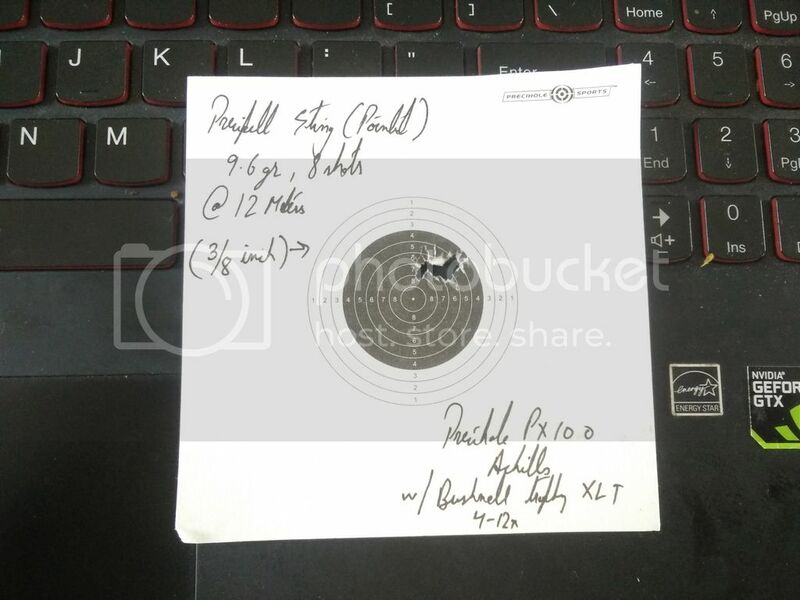 All shots were taken in the prone position without any rest on 10m ISSF air rifle target paper. THe distance from the target to the rifle is approx 12m. Overall the rifle has been a mixed bag. While Precihole sports has done a commendable job on the first Indian made PCP, the price tag of Rs. 30,000/- i.e. about $480 is on the higher side when taking Purchasing Power Parity into account. The fit and finish, power adn accuracy work well for the gun but the whippy barrel and lower weight work against it. SO, would i buy it if it were available for around ~18k : YES. Would i buy it if i could get a suitable foreign PCP (e.g. benjamin Marauder) for the same price : Probably not. Gurgaon/Delhi NCR people, a meet soon perhaps? 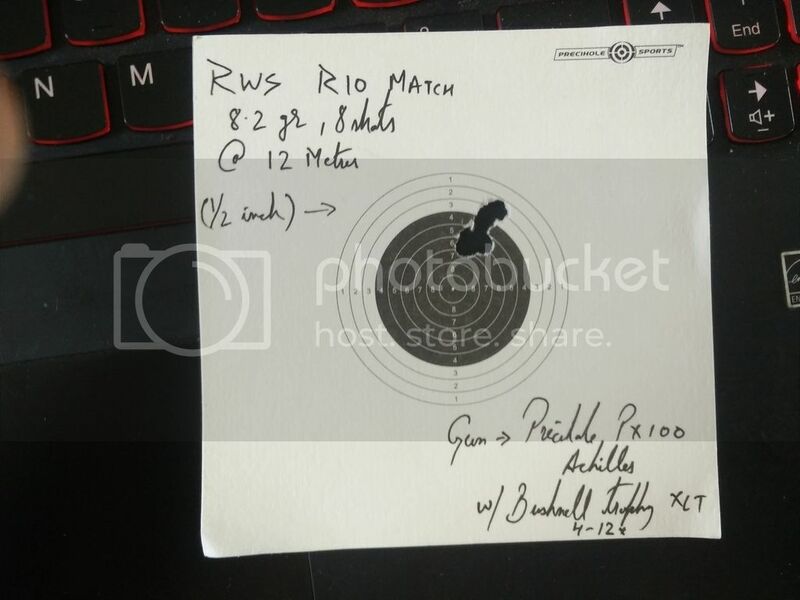 Nicely written review and good groupings (Specially since you are shooting without a rest).. thanks for sharing. Nice write up Scarecrow. Even though I received my Achilles a few days ago I was unable to test it much due to continuous rains in my place. I am doing it whenever possible. 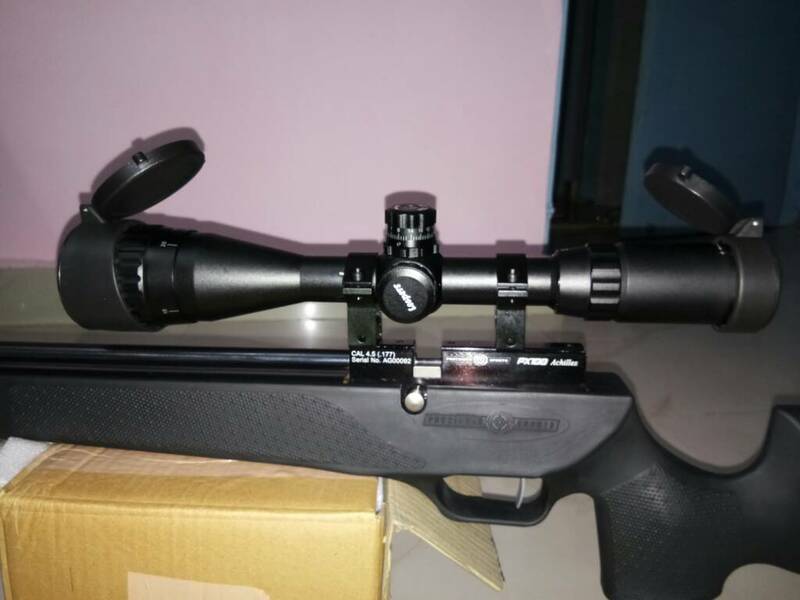 My UTG 3-12 x 40 IR AO scope looks too big on Achilles so fitted my UTG 3-9 x 32 AO on it and after shooting several different pellets at a single shoot and see target offhand to see their POI and also to get familiar with the gun, I zeroed my scope at 15 yards with JSB 8.44 grn pellets. The results are good. air pressure was 150 BAR when these groups were shot. These are the last two 5 shot groups shot when zeroing the scope from a crude rest under the fore end. This is my first shooting day with this gun. In both groups first 4 shots are pellet on pellet. 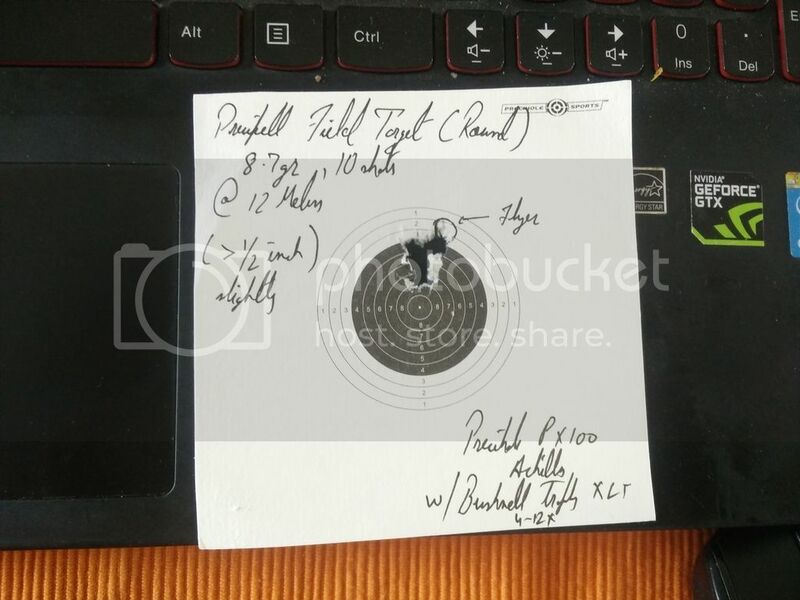 When I shot the second pellet I saw the same hole and I was wondering how could I miss the entire target at that range. The third shot result is the same only then I realized that the pellets are going into the same hole. 4th shot same. Then excitement rose with hear beating fast and 5th shot landed a couple of mm low. The same thing happened with the second group. So I decided to pack up and leave. A week ago scarecrow emailed me asking me to start the thread first in my name and then he would add his views. 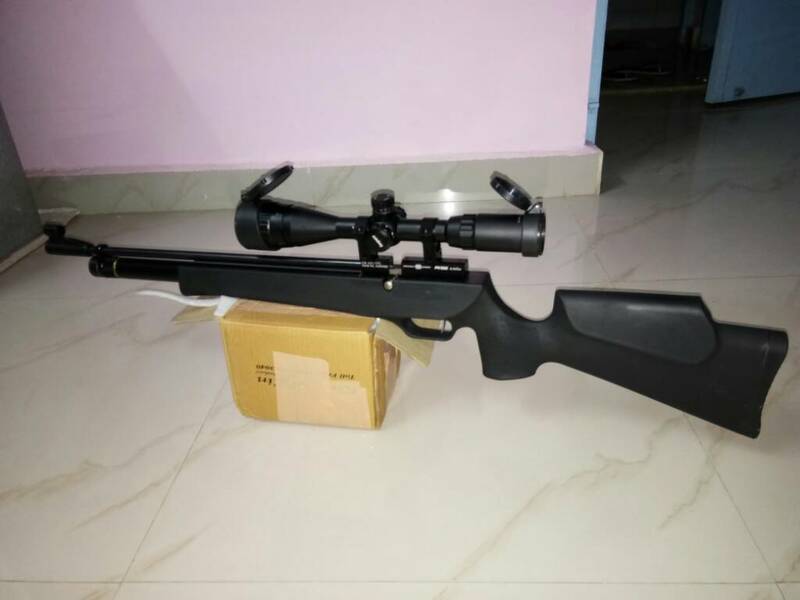 At that time I had not received the gun and anyway my review would take time because I wanted to cover everything chrony results, accuracy tests at various ranges with different pellets etc. I wanted to do the entire review in one single post. Actually I was waiting for his thread for the past week. Anyway with rains becoming a major factor I could not do the entire testing in one single day. So from now on I'll post my findings on daily basis. Yesterday it was raining continuously and was confined to my home. So made a basic shooting stand for my Achilles. It is stable and would work great for a PCP. I made it to fit Achilles and me specifically. I'll have the FX magazines today. I'll post my views from the beginning later this day. Accuracy is phenomenal at 15 yds. For power , I will wait for GNV's F1 Chrony result. Thanks for sharing GNV, great to see that the rifle is so accurate. One question though, I have the same Hill Pump as yours (ordered from the same place as you I think, since I paid the same amount), did you need any special adaptors to use the pump? Looking forward to your posts as you share more results with your new PCP! Happy Shooting! Precihole Fill Probe comes with a Metal washer you have to remove it and fit the probe to Hill Pump connecting Hose. Thank you for the response sir, good to hear that no other special adapters needed. 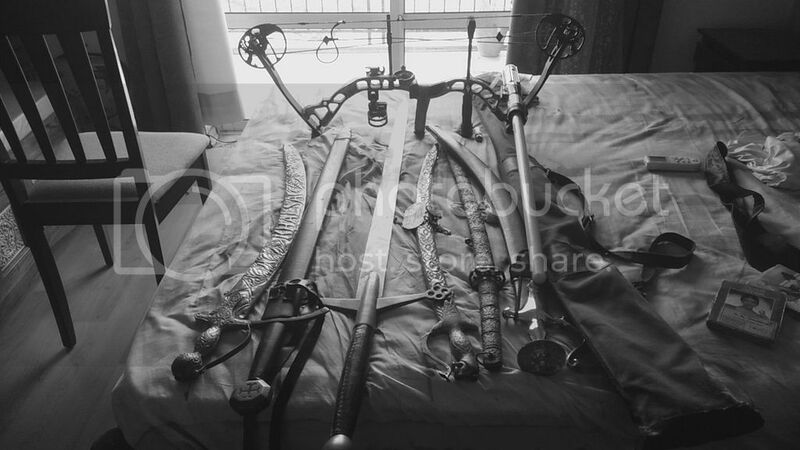 "Men like us don't deserve to die in the bed, field would be a batter option"
The precihole sports website mentions a regulator. Rest assured it is a regulated PCP. The velocity results you see are from the chrono connect mobile app and i think they're fairly off. Let us wait for GNV's chrony testing results. I chronographed my PX-100 Achilles using four different pellets. Shooting Chrony Model: BETA. Distance from muzzle to chrony is 5 ft.
That is pretty impressive !! Wow Great gun. All the import hassles are over thanks Precihole for delivering us a PCP. SD less than only 7 FPS, incredible consistency. Thanks GNV.